A village hall committee has stopped people parking their cars in its car park overnight. Braunston Memorial Village Hall had allowed a number of residents to leave cars on its premises because of yellow lines that prevented parking in nearby streets. Those who took advantage included landlord of the nearby Wheatsheaf pub Glen Thompson, who had used a space for the last six years. But after recent resurfacing, the village hall committee has written to residents telling them that the facility has been withdrawn. Mr Thompson said: “Its unbelievably petty. They have a new car park and it seems like they don’t want to dirty it with tyre marks. “I was told by the committee that there were up to nine cars in there some nights. “I’m looking across at the car park as we speak and it’s completely empty. Anyone who leaves their car in the village hall car park overnight now runs the risk of having it towed away. Mr Thompson said the new policy had impacted on his customers because some used to leave their car there rather than drive home. 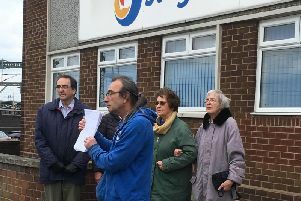 Chairman of the village hall committee Graham Newman refused to discuss the matter with the Daventry Express, and referred our reporter to a letter sent by the committee to Mr Thompson. However the letter gives no proper explanation of the reason behind the ban. It says: “The committee has decided that it will stand by the original decision to prohibit overnight parking.